"Buckwheat – our mother," - said in Russia. About the benefits of buckwheat has long been known. Today it is an indispensable component of a healthy diet. 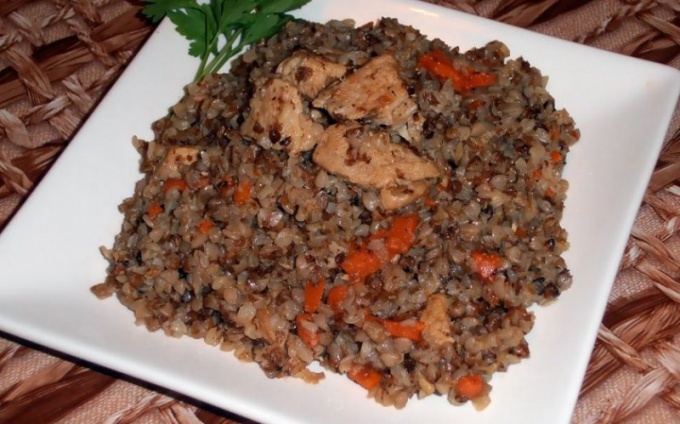 In buckwheat contains digestible proteins and useful amino acids, rich in vitamins and minerals. And in combination with beef buckwheat doubly useful. Both of these products are a source of iron and are faithful allies in the fight against anemia. Meat thoroughly under running water, dry on paper towel and cut into small pieces. Onions clean from the husk and finely chop. Then mix beef with onion, salt to taste and place in portion 3 of ceramic or cast iron pot. Buckwheat loop, remove the blackened grain and rinse. For cooking this dish if you wish, you can take a mixture of buckwheat and millet in equal proportions. Then pour in each pot for 4 tablespoons of grains. Add the finely crumbled Bay leaf and pour broth made from chicken or mushroom cube. Cover the pots with lids and place in the oven for about an hour to prepare at a temperature of 190-200oC. First of all, peel the onions and carrots. Then cut the onion in cubes, carrots grate on a coarse grater. The removable bowl multivarki pour vegetable oil and place the prepared vegetables. Install panel mode "Baking" and time 20 minutes. Press "Start". While preparing the onions and carrots, thoroughly rinse beef, Pat dry and cut into small cubes. After 10 minutes from the start of cooking, add meat to vegetables. Sprinkle beef with spices, salt and mix gently. Wash tomato and cut it into cubes, and the white part of the leek – rings and after a sound signal about the end of the "Baking", add the tomato and leek in bowl with meat. Buckwheat loop, rinse and connect with other components. Dissolve in cold boiled water tomato paste and pour into the bowl. After that, close the slow cooker tightly with the lid and start on the control panel the program "Buckwheat". In this automatic mode, the slow cooker will switch off automatically after evaporation of water. Please note that while cooking the lid can not be opened.